This park is just steps from the ocean, but it’s situated on a long, narrow plot of land and bounded by major streets on three sides. 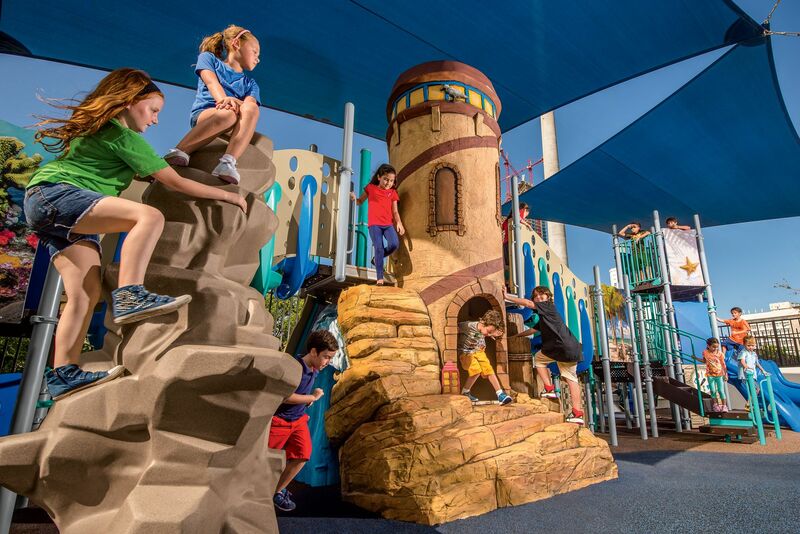 Seeking a compact, yet creative oasis with a beachy feel, the customer commissioned Playworld to design a custom play destination. We made the most of the small space, using a mix of standard playground components and brand new creations. The highlight of this playground is the concrete lighthouse set atop a rocky shore that kids can climb (from outside or inside) to access a deck. Custom ocean graphic panels and a sea-worthy color palette further enhance the coastal vibe. And because it’s always sunny in Sunny Isles, shades over the entire space make it a “cool” place to hang out.